Straight Out of Kampung has moved! The SOK family has repatriated to the US, so we are no longer straight out of the kampung, but rather coming straight out of Katy, TX. Luckily, Texas has foods just as new and exotic to me as Malaysia, so the culinary adventures will continue at my new blog, Lone Starving. Thanks for reading, and hope you enjoy the new incarnation! 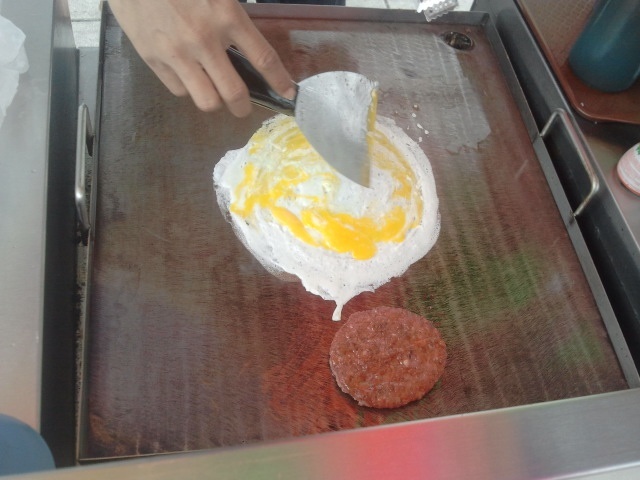 The hard-working Ramly burger guy. It’s been a while since my last post, and I have less than a month before we leave Malaysia and Straight Out of Kampung turns into Straight Out of Houston. 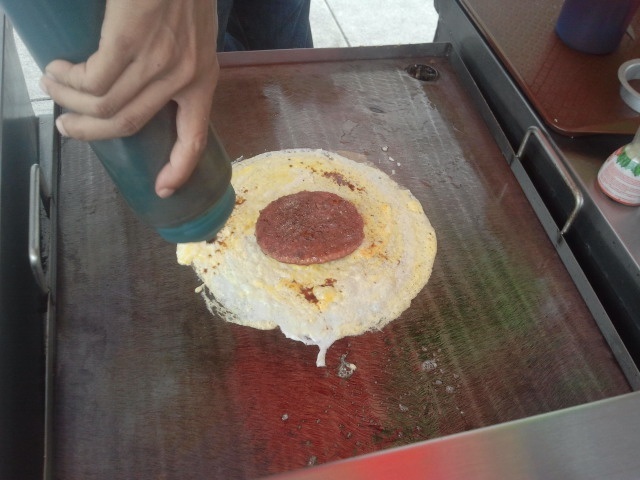 So I’m trying to cover some Malaysian classics that I’ve missed, like the Ramly burger. 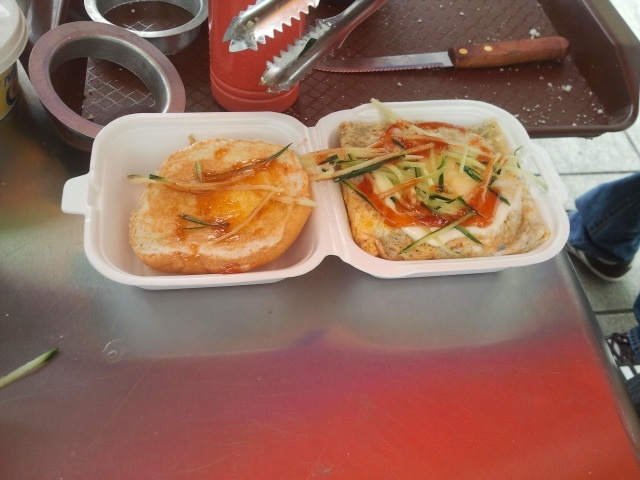 Standard garnishes are gobs of mayo, chili sauce, cucumber (cheaper than pickles), and tomato, though this stall substituted mango—again, cheaper than tomatoes, and tastier to boot. The result is a sloppy, sticky, salty-sweet mess packed with grease and MSG. 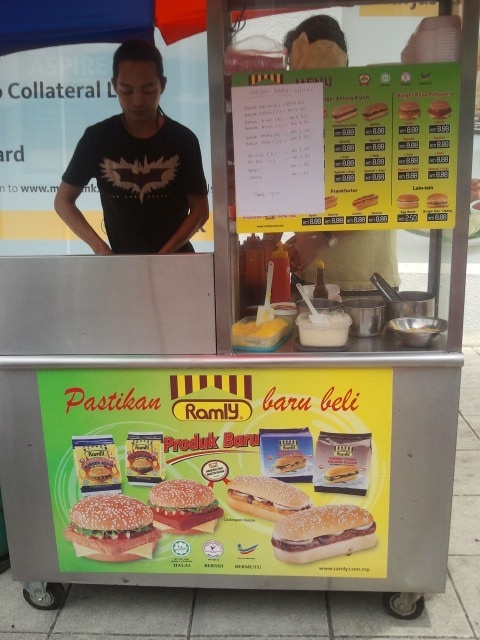 Did I mention that Ramly burger stalls almost always open in the evening and operate into the night, the better to serve the appetites of midnight snackers and stave off incipient hangovers? You won’t find the Ramly burger on any list of essential Malaysian foods, but it’s one of the things I’ll definitely miss when I leave KL. I was halfway through my Chicken McRib when I realized I forgot to take a photo. What, you’ve never heard of chicken ribs? They’re just like baby backs, but for when you’re watching portion sizes. In all seriousness, the Chicken McRib is the halal-ified answer to the regular McRib. Just like the pork version, the Chicken McRib is mechanically separated (chicken) meat formed into a rib-shaped patty and slathered with barbecue sauce. To be honest, it’s been so long since I’ve had a McRib (which is a regular menu item in Germany) that I don’t really remember what it tastes like, but I didn’t feel like I was missing out with the chicken. There’s also a double version, but you’re better off just ordering two sandwiches, as the pickle/onion-to-meat ratio is off on the double. 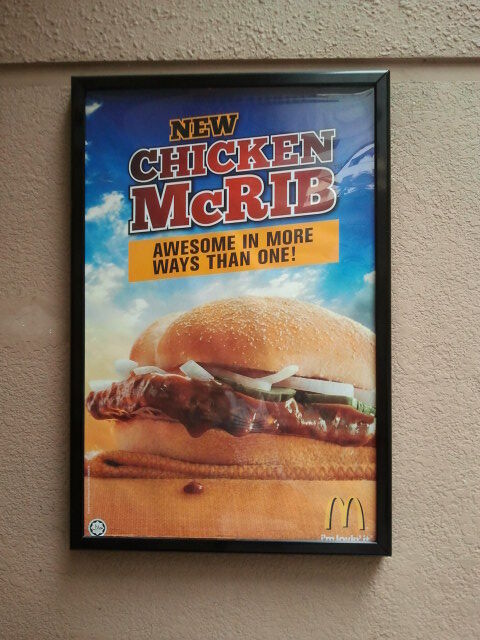 I’m not sure how the Chicken McRib is “awesome in more ways than one.” I guess it’s awesome that there’s a pork-free version of the cult favorite, but that’s only one kind of awesomeness. Anyway, if we’re talking about awesome chicken-based replacements, I think the shout-out should go to the chicken sausage they use in the McMuffins here. I actually prefer it to the pork version, which is not something I say very often (OK, ever). Personally, my favorite seasonal McDonald’s item in KL is still the GCB (grilled chicken burger). Also, waffle fries, which are even better than the regular fries. What’s your favorite seasonal Mickie D’s? Tell me in the comments! September 19th was the Mid-Autumn Festival, celebrated by Chinese communities with lanterns and the giving and eating of mooncakes, round pastries traditionally filled with sweet bean or lotus pastes which could be considered the Chinese equivalent of fruitcake. The gift-giving aspect of mooncakes has led to something of an arms race in the packaging and novelty-flavor factor. Mooncakes come in resplendent boxes (we’re using one of them, actually a little chest of drawers, to store Mr. SOK’s cuff links) and are offered in ever more exotic flavors; non-Chinese franchises like Starbucks, Häagen-Dazs, and Godiva have gotten in on the action with modern offerings like chocolate fillings and ice cream mooncakes. The original “modern” mooncake is the snowskin mooncake, which is actually a cousin of mochi ice cream: an ice cream filling is surrounded by a soft, slightly sticky wrapper made with glutinous rice flour. 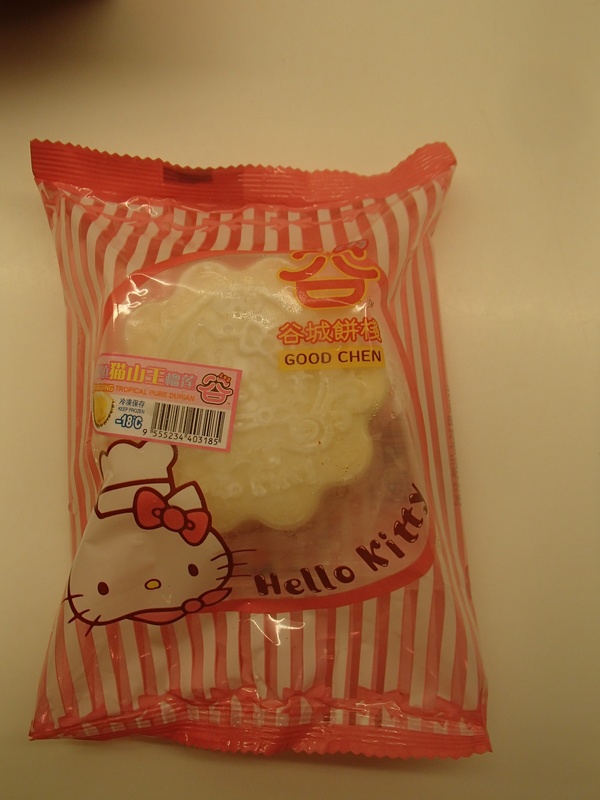 Although buying your own mooncake is kind of like throwing yourself a shower, I had to get the Hello Kitty durian snowskin mooncake, which I think is the most Asian food item I’ve had. On nice weekend mornings, Mr. SOK likes to ride his motorcycle on the windy mountain roads surrounding KL. My reward for staying at home with the baby is a load of fresh vegetables, as there are a bunch of farms that take advantage of the (relatively) cool air. This is where Malaysians grow things like lettuce and strawberries and mushrooms, which would wilt in the tropical heat of the lowlands. This week he brought back fresh wood ear mushrooms and daylily buds (also called golden needles in Chinese). Though you’re not likely to find daylily buds at the supermarket any time soon, they’re widely eaten in both East and West, and since they’re such a common garden plant, they’re also an entry in Foraging 101. Just Google “daylily bud recipes” and you’ll get tons of hits. 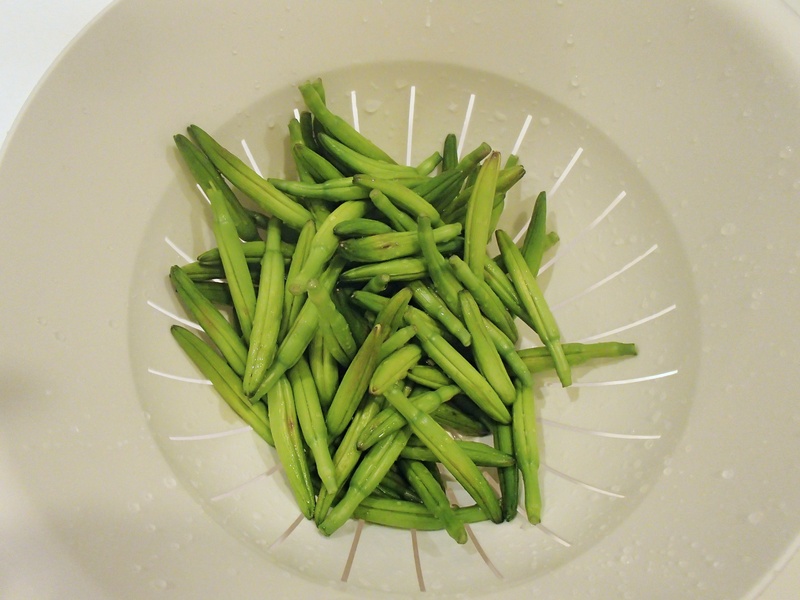 Most call for a simple approach, like a stir-fry or saute, to preserve the delicate flavor of the buds. I decided to riff on mu shu pork, which traditionally calls for daylily buds and wood ear mushrooms, and make a stir-fry with the buds, some fresh wood ear mushrooms also procured from the highlands, and chicken. The buds are very tasty, with a texture similar to very fresh, tender green beans, and a flavor that’s a combination of vegetal and sweet. Unfortunately, both Mr. SOK and I appear to be in the small minority of people (about 2%) with a sensitivity to daylilies. We had eaten them before, during the unfortunate episode with the chili peppers of doom, but it appears that some of the ill effects might have been due to the buds, as we both got sick that evening. (I had both the mushrooms and the chicken the next day without incident, so by process of elimination, it had to be the buds.) I hope this doesn’t discourage anyone from raiding their own flower garden, but maybe try a few out (cooked) before going whole hog and throwing a daylily bud party. Malaysians love trendy things, and food, so it’s no surprise that cronuts have debuted here, under the non-trademarked name KLonut, which is a play on the city of origin (Kuala Lumpur) and not Asian pronunciation. They’re available at the equally punnily named Dessert Storm. I’d had my eye on them for a while, and then a college friend came for a visit and gave me my excuse to try them out. Their signature flavor is peanut butter and caramel, but I went with the more “localized” flavors of the week, The Breakfast and the Kaya. 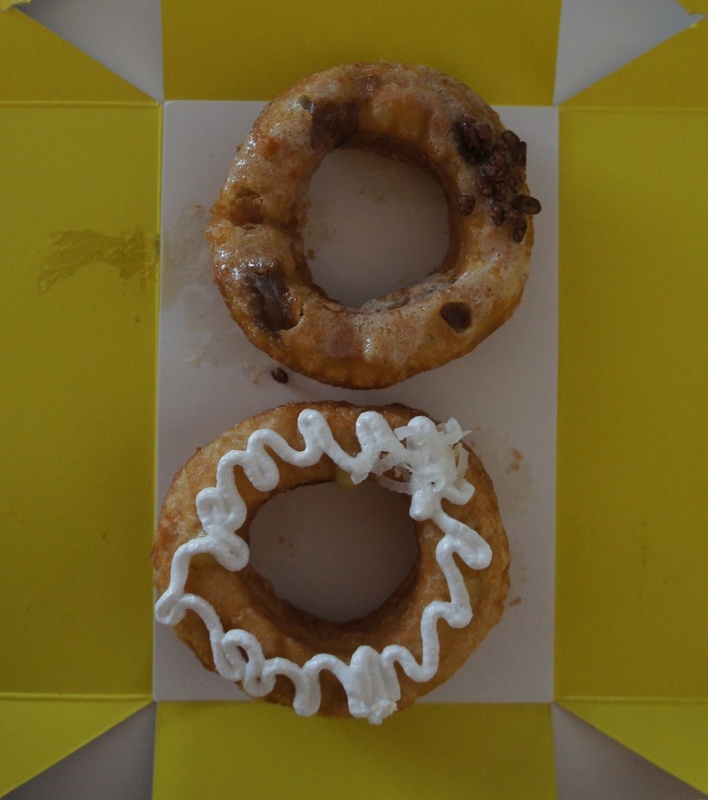 I mean, why get a normal cronut when you can get something Malaysian? 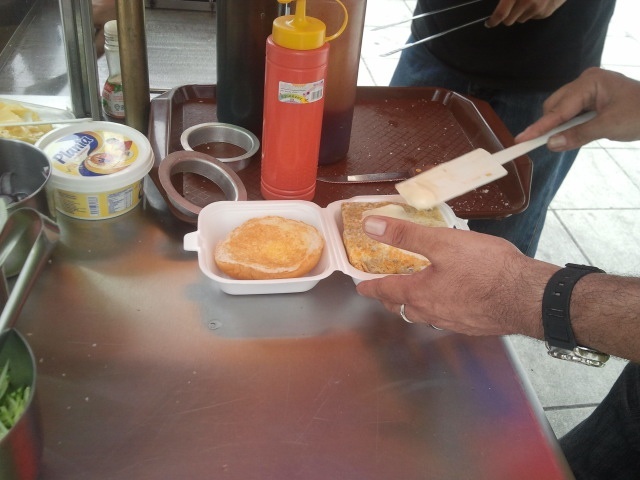 The Breakfast was filled with Milo-flavored custard and topped with condensed milk and bits of Milo cereal — Malaysia’s version of Cocoa Krispies — while the Kaya was filled with a coconut custard. So, are cronuts/KLonuts/doissants worth queuing up for, as they do in New York and London? (And have I been living in Malaysia too long, now that I’m saying “queue” instead of “line”?) Now that I have a baby in tow, I’m going to say no, as there is no foodstuff I’m willing to wait for with a potentially cranky infant, even dim sum at Tim Ho Wan’s. Luckily, there was no such crowd at Dessert Storm. 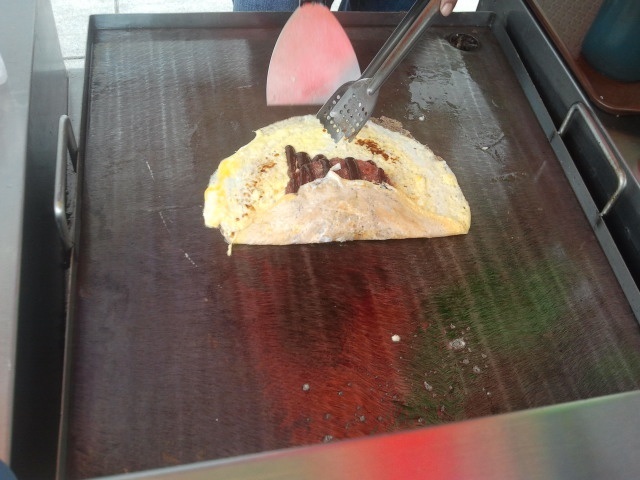 We tasted The Breakfast first. My trip to the US entailed spending a lot of time at the Frankfurt airport — 6 hours on the way there, 8 hours on the way back. With a baby. There are, certainly, worse airports to while away the day — LAX comes to mind — but Frankfurt is no Changi. Or even Schipol (which, I hear, has excellent facilities for keeping your kids entertained). The biggest problem is that you have to go through passport control when exiting the terminal, so unless you’re willing to go through all the security, you’re kind of stuck. (I was actually game, but the nice man at the Lufthansa counter strongly advised against it, and I figured he knew what he was talking about.) On top of this, the Lufthansa lounge had no day passes, so I couldn’t even pay to get in. At least there were showers (though only Euros or USD are accepted, which is problematic when flying in from Malaysia.) And the free airport wifi only lasts 30 minutes!